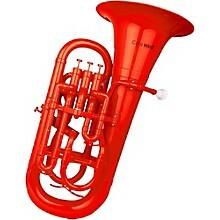 Plastic euphonium in a 3 + 1 valve configuration. Plastic "brass" instruments have been in the marketplace for a few years now. First came the trombones, then the trumpets, and now, manufacturers are taking what they’ve learned and are applying it to more ambitious designs such as these plastic euphoniums. Cool Winds is at the forefront of this design and manufacturing revolution. The Cool Winds Bb euphonium features a bore of 0.57 – 0.66 in. with a 12.2 in. diameter ABS bell and four all-metal valves in a 3+1 configuration. Comes with large shank mouthpiece and soft gig bag. Great-sounding, lightweight low brass. Order today.